Even in the most ideal and favorable circumstances, cooking dinner is not my favorite activity. During the school year, I cobble together reasonably decent meals for my family. Come summer all bets are off. My school administrator husband steps up and manages dinner prep for most of the summer when he is home from school. I cook the rest of the time. Some days neither of us want to cook. Sometimes we grill or take food to the pool. Last Wednesday was a case in point. The kids had swim practice in the morning. My teens had work. I had a ton of dead lines. One of my teens had another swim practice. I texted my on-the-go husband and cried uncle on dinner. He readily agreed that cooking dinner wasn’t going to happen that night. We texted back and forth while he waited to pick up our middle child from her second swim practice of the day. I suggested KFC. He readily agreed. 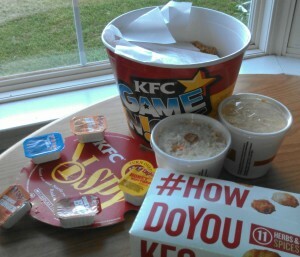 Eating KFC was declared the perfect choice for a busy summer dinner time. My husband picked up the KFC I SPY Game Night Bucket. He set the bucket on the table and kids appeared from all over the house. The meal was devoured! The I SPY Game Night Bucket is KFC’s newest menu offering. Part yummy food. Part family game night. This new interactive menu item brings families together…like mine. We feasted on Extra Crispy Tenders slathered in delicious sauces. We chowed down on mashed potatoes and gravy. We slurped mac and cheese. It was a rainy night so we ate inside, but I hope to bring KFC to the pool very soon. With the I SPY Game Night Bucket KFC celebrates family values upon which the Colonel built the brand. The KFC Game Night Bucket featuring I SPY is perfect because the family that plays and eats together, stays together! a free I SPY game and a bonus I SPY posters. 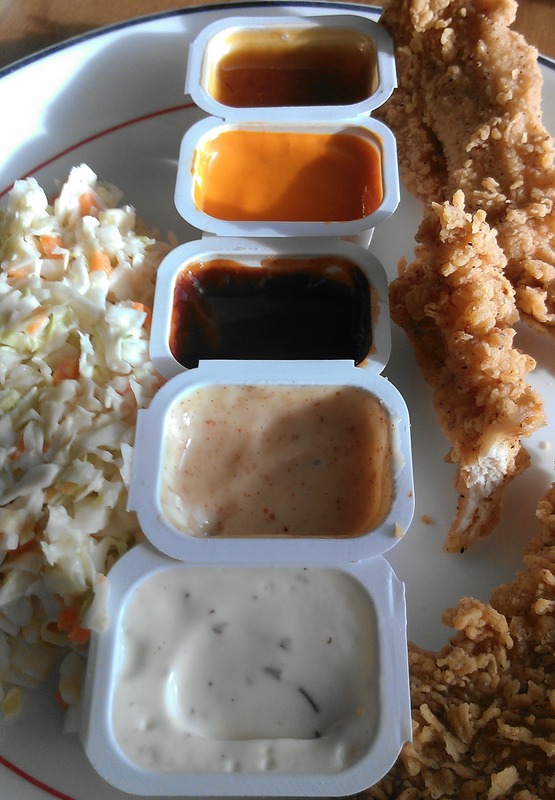 12 KFC’s famous Extra Crispy™ Tenders. For larger families, the Game Night Bucket is also available with 20 Extra Crispy Tenders. Disclosure: I was sent KFC Gift Checks to facilitate my review. The views expressed in the post are my own.